A Dec. 6 & 7 workshop at W&M, coordinated by undergraduate students in conjunction with the Veterans Writing Project, will help service members and their families share their stories. W&M Law School's annual Thanksgiving food basket drive led to the collection of a record amount of food to help needy families in the Williamsburg area. The Board unanimously approved a resolution Friday extending the contract of university President Taylor Reveley through June 2017. Reveley served as the Law School's dean from 1998 to 2008. The Law School recently hosted students from a public school in Newport News to gain experience in legal thinking and an understanding of law school life. Shang Dai LL.M. '03 recently returned to the Law School to share the story of his career and give advice to LL.M. students. Va. Governor Bob McDonnell announced his appointment of Chancellor Professor of Law Ronald H. Rosenberg to the authority on Nov. 15. By the close of fall semester, W&M law students will have presented oral arguments in the Third, Fourth, Sixth, Eighth,and D.C. Circuit Courts of Appeals. Three distinguished leaders - Evan Bayh, Glenn Hutchins, and Linda Klein - took center stage on Oct. 9 to discuss and debate the most pressing issues facing the country. Prof. Allison Orr Larsen recently discussed the Bill of Rights with reenactors portraying James Madison and Patrick Henry in the first episode of Colonial Williamsburg's Emmy Award-winning 2013-14 Electronic Field Trip Program. The Property Rights Project presents the award each year to an individual whose work affirms that property rights are fundamental to individual liberty. On Friday, Nov. 1, the William & Mary Law School will host its first immigration reform conference. Rosenberg's article was recently cited by the U.S. Supreme Court in Justice Alito's majority opinion. Evan Bayh, who served as U.S. senator from 1999-2011, and governor of Indiana from 1989-97, visited the Law School on Oct. 9 as part of the third annnual McGlothlin Leadership Forum. The Institute of Bill of Rights Law at William & Mary Law School held the 26th Annual Supreme Court Preview on Sept. 27th and 28th. VOTEline - at (757) 221-2890 - is a nonpartisan, voter assistance hotline aimed at responding to questions local citizens have about voting on Tuesday, Nov. 5. Professor Hassan Al-Sayed, a guest scholar from Qatar, enjoys his time at William & Mary Law School conducting comparative legal research. Prof. Adam Gershowitz offers a course that uses the hit series The Wire as a springboard to discuss some of the most pressing issues in criminal law. 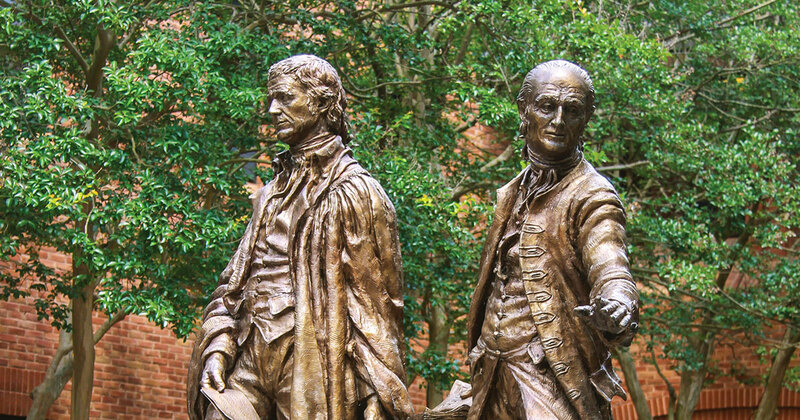 The William & Mary Property Rights Project announced today the publication of the second volume of the Brigham-Kanner Property Rights Conference Journal. The case pending before the Supreme Court involves a Massachusetts law that restricts all expressive activity within 35 feet of entrances, exits, and driveways of all reproductive health care facilities, including abortion clinics. Linda Malone, Marshall-Wythe Professor of Law, discusses the Syrian crisis. Come join us at the plenary session discussion with the 2013 McGlothlin Fellows on Oct. 9 at 2 p.m. at the Mason School, featuring former U.S. Senator Evan Bayh, Glenn H. Hutchins, co-founder of Silver Lake; and Linda A. Klein of Baker Donelson. Free and the public is welcome. On Thursday, Sept. 12, William & Mary law students gathered with members of the local community in the Williamsburg Regional Library's theater for the first event of the fourth annual series of Constitutional Conversations. Two W&M students - one from the Law School and one from the Mason School - were honored on Sept. 12 as Alvin P. Anderson Scholars. On Aug. 22, senior Department of Veterans Affairs (VA) administrators joined with Senator Mark Warner of Virginia to announce that William & Mary Law School's Lewis B. Puller, Jr. Veterans Benefits Clinic joined the VA's Fully Developed Claims (FDC) Community of Practice. On Wednesday, Sept. 4, Professor Daryl Levinson of New York University School of Law presented the annual James Goold Cutler Lecture to a packed room of William & Mary Law School students and faculty. Stephen P. Carney '72, J.D. '80 was recently honored with the 2013-14 St. George Tucker Adjunct Professorship Award from William & Mary Law School. Members of the law Class of 2016 and LL.M. students enjoyed a private guided tour of Colonial Williamsburg. William & Mary Law School recently welcomed new students to the Marshall-Wythe community. W&M was one of only 11 of the nation's 200 law schools to report an increase in J.D. applications this year. William & Mary law alumnae who work as in-house counsel will return to the Law School on Sept. 19-20 for a two-day discussion with students, faculty, and other William & Mary law graduates about their careers and the challenges and rewards of this area of practice. U.S. Senator Mark Warner visited campus on Wednesday, August 21, to help greet the law school's newest students, as well as to make a special announcement about the Law School's Lewis B. Puller, Jr. Veterans Benefits Clinic. Watch the live webcast on Friday, Sept. 13, at 9AM EST of "Adaptive Planning for Flooding and Coastal Change in Virginia: Legal and Policy Issues for Government." During the Oct. 17-18 event, the W&M Property Rights Project will honor Professor Thomas W. Merrill of Columbia. William & Mary's clinic is the first law school clinic in the nation to be certified as a national "best practice." William & Mary Law School recently hosted the third annual Institute of Special Education Advocacy (ISEA). William & Mary Law School's alumni and friends supported the School in record-breaking numbers during the fiscal year that ended June 30, 2013. Research by Christopher L. Griffin, Jr., an assistant professor at William & Mary Law School, has been highlighted in the Stanford Law Review's recent special issue on empirical legal scholarship. Taylor Reveley, president of the College of William & Mary, was recently honored with the William R. Rakes Leadership in Education Award from the Virginia State Bar Section on the Education of Lawyers in Virginia. Faye Shealy, the associate dean of admissions at William & Mary Law School, was recently inducted as an honorary alumna of the College. Prof. James G. Dwyer appeared on the Canadian Broadcast Corporation Radio One's "The Current" to discuss a prison program that allowed mothers to keep their children with them behind bars. Gates Urges Graduates to Heed "Duties and Responsibilities That Come with Citizenship"
W&M Chancellor Robert M. Gates, a 1965 graduate of the College, gave the address at the Class of 2013 Diploma Ceremony. Charles F. Midkiff '70 was inducted as an honorary member of the Order of the Coif during William & Mary Law School's Awards Ceremony on May 11. Fredric Lederer, the Chancellor Professor of Law at William & Mary Law School, has been named recipient of the inaugural George Wythe Society Award. A new honor, the John E. Donaldson Award for tax law, was unveiled at the Law School's annual Awards Ceremony on Saturday, May 11. On Saturday, May 11, the Law School community gathered in Colonial Williamsburg's Kimball Theatre with soon-to-be-graduates, their families and friends to celebrate the Class of 2013's contributions and achievements. The honor is given by the Law School in recognition of outstanding service by a member of the student body. The award recognizes great professional promise through scholarship, character, and leadership. Alumna Judy Conti, co-founder of the Employment Justice Center, was honored for demonstrating outstanding citizenship and leadership in her life and work. Alumnus Chris Rey, the mayor of Spring Lake, N.C., received the award for his outstanding commitment to public service. The following are the prepared remarks of W&M Chancellor Robert M. Gates. Gates, a 1965 graduate of the College, served as U.S. Secretary of Defense from 2006 to 2011. May 14 letter urges Senate colleagues to consult guide created by Puller Veterans Benefits Clinic to learn how to establish pro bono programs at law schools in their states. The report, prepared at the request of the ABA Standing Committee on Election Law, is a descriptive effort, drawing on media coverage and interviews with election officials to dissect when, where, and under what circumstances voters experienced delays on or before Election Day 2012. The fellowship program has helped recent graduates land jobs, hone skills, and build professional networks. W&M Chancellor Robert M. Gates, who served as U.S. secretary of defense from 2006 to 2011, will give the address at the Law School's graduation ceremony on Sunday, May 12. Law students in this new clinic learn from scientists while they research the legal and policy implications of rising sea levels. William & Mary Law School alumni Robert E. Scott '68 and Thomas R. Frantz '73 were elected, respectively, vice rector and secretary to the College of William & Mary's Board of Visitors on April 19. First-year law students Debra Wong, Aaron Gold, and Sean Campbell were recently announced as winners of the 2013 Kaufman & Canoles Writing Prizes, awarded each year for outstanding performance in William & Mary Law School's Legal Practice Program. Press Stories Hail Veterans Benefits Clinic as "National Model"
The work of the Puller Veterans Benefits Clinic has been featured in stories in the Daily Press of Hampton Roads, Va., and in Stars and Stripes. Senator Mark Warner says Puller Veterans Benefits Clinic could be a "national model" to create law school clinics across the country to help solve the Veterans Administration's backlog of cases. Professor Paul Marcus moderates a discussion about digital evidence with two colleagues, Professors Jeffrey Bellin and Adam Gershowitz. W&M is one of only eight law schools nationally to have increase in applications this year. The volunteer attorneys and students of the Lewis B. Puller, Jr. Veterans Benefits Clinic were honored with the 2013 Lewis F. Powell, Jr., Pro Bono Award by the Virginia State Bar. NPR affiliate WHRV 89.5 interviewed Professor Jeffrey Bellin about the legal issues and unfolding legal case. The W&M Law School Association honored Daymen Robinson with the 10th Reunion Distinguished Alumnus Award during the school's April 6 reunion dinner. Four law faculty are among 20 W&M professors selected to receive the awards, which recognize exemplary achievements in teaching, research and service. To cast your vote for nominees to the Association's Board of Directors, please submit a Nomination Proxy or attend the Annual Meeting on Friday, April 5, at 1 p.m. The Law School's George Wythe Society hosted a mock legislature on March 15 in the Wren Chapel, continuing a tradition begun by Professor George Wythe in the 1780s. Dean Davison M. Douglas announced that the university's Board of Visitors at their February meeting conferred tenure on Angela M. Banks and promoted her from associate professor to professor. Members of the William & Mary Law community attended a reception and dinner on March 14 to honor the life of Professor Charles H. Koch, Jr.
Columbia Law School Professor Thomas W. Merrill will receive the 2013 Brigham-Kanner Property Rights Prize at the 10th annual conference on Oct. 17-18. The March 28 article cites "The Indefensible Duty to Defend" by Professor Neal Devins (with Saikrishna Prakash), published in the April 2012 issue of the Columbia Law Review. March 20 decision by Fifth Circuit protects liberty and consumers from "crony capitalism," writes Meese in blog. Associate Professor of Law Eric Chason, director of the W&M Tax Conference, shares his thoughts in this video interview. ELS presented the award to alumnus Jeff Palmore, director of policy development and deputy counselor to Va. Governor Bob McDonnell, on March 15. W&M's education, law and business schools were recognized by U.S. News as among the country's best graduate programs. On Dec. 21, President Obama announced the appointment of Professor Michael Stein to serve as a member of the U.S. Holocaust Memorial Council. The Center for Legal and Court Technology staff and W&M law students were recognized for their help in designing the city's new municipal courthouse, which replaced one destroyed during Hurricane Katrina. On March 22 the Center for Legal and Courtroom Technology and the University of Montreal's Cyberjustice Laboratory will conduct a simulated, concurrent hearing in the two countries about a fictional marine incident. W&M Law students recently attended etiquette dinners to learn more about the protocol behind elegant dining. Professor Eric A. Kades recently shared his research on "The New Feudalism" as the 2013 St. George Tucker Lecture at William & Mary Law School. Staff from W&M Law School's Lewis B. Puller, Jr. Veterans Benefits Clinic recently attended a meeting at the White House to report on the Clinic's first four years of operation. Six William & Mary Law School alumni were inducted into the 2013 Class of Fellows of the Virginia Law Foundation during the Virginia Bar Association's annual dinner in Williamsburg. W&M Law Student Appears on "Millionaire"
Derek McMahan, a student at William & Mary Law School, appeared on the popular game show "Who Wants To Be A Millionaire" on March 4. The William & Mary Board of Visitors approved a proposed $14 million expansion and renovation to the William & Mary Law School during its February 2013 meeting. Jayne Barnard joined the W&M Law faculty in 1985 and is the Cutler Professor of Law. A highly rated morning TV news program on Chinese CCTV 13, similar to Good Morning America, recently broadcast a story about William & Mary students studying Chinese and preparing to celebrate the Chinese New Year. The Feb. 21 event will feature the co-chair of the President's Commission on Election Administration, the Colorado Secretary of State, election law attorneys and scholars, and Virginia registrars. This story by John Hardin Young appeared in the Winter 2013 edition of The Voice of Experience. W&M Law Professor Linda Malone was widely quoted by the international news media about Nguyen Quoc Quan's recent release from prison in Vietnam. The National Center for State Courts, Center for Jury Studies, and the Institute of Bill of Rights Law will co-host the Feb. 22 - 23 event. 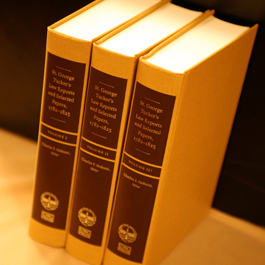 William & Mary Law School celebrates the completion of Charles Hobson's three-volume St. George Tucker's Law Reports and Selected Papers, 1782-1825. Professor Eric A. Kades will present the St. George Tucker Lecture titled "The New Feudalism" on January 31 at 3:30 PM in room 127. The Law Alumni Association seeks nominations for awards honoring distinguished graduates from the classes of 1988 and 2003. Donald G. Owens '65, J.D. '71 is one of three William & Mary alumni who will receive the 2013 Alumni Medallion during this year's Charter Day weekend in February.